I am the type of person who prefers movies that doesn’t have bad villains on a killing spree. I prefer watching movies that makes me feel good and relaxed. After all, when I watch a movie it’s because I want to relax so how could I possibly relax when my blood is rising with every scene? It’s why I really love Shrek the movie. It’s one of my favorite movies and I’ve watched all 3 films! And, I didn’t just watch it one time I bet I’ve watched it over 10 times each! That’s how much I love this movie! I love Shrek and Fiona! I’m such a fan. 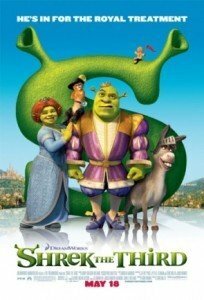 Shrek 3 is similar to Shrek and Shrek 2 where there are lots of singing and their own versions of the popular songs we are all familiar with. I love all the evil villains such as Captain Hook, the Wicked Queen, the Headless Horseman and even Pinocchio’s puppet master! 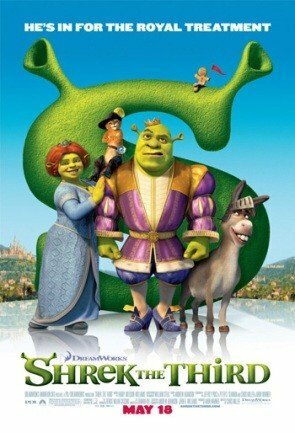 In this movie Fiona’s dad, the King died but before he died he told Fiona and Shrek that they are the next in line for the throne. Shrek was not happy with this and asked if there is another way to solve the issue and King Harold said that there is someone else in line, and that is Arthur, his nephew. Shrek was in a quest to find this Arthur and saw that he was a laughing stock in his school and was called a loser. Eventually though, Arthur became victorious with the fight against Prince Charming and he accepted the throne as the new king. Shrek and Fiona returned to their swamp and had 3 babies. Now, that’s what I call a happy ending.